The two most opposite words in the English language are Geology and Boredom… Imagine a beautiful seafloor of sponges, corals, starfish, and crinoids both sessile and free swimming…then witness a tidal flow depositing many of these into a swirl eddy deposit and remaining fossilized since the Mississippian. Remember, during this time the uplifted cliffs we mine these from were originally deposited during a time when Arizona and much of North America was at the equator. After eons a slow migration to its present site in central Arizona and supergene enrichment of copper solutions imbued these Crinoids with beautiful blue Chrysocolla. Arizona is a mineralogists dream. The fossil horn coral in this cabochon is well preserved. 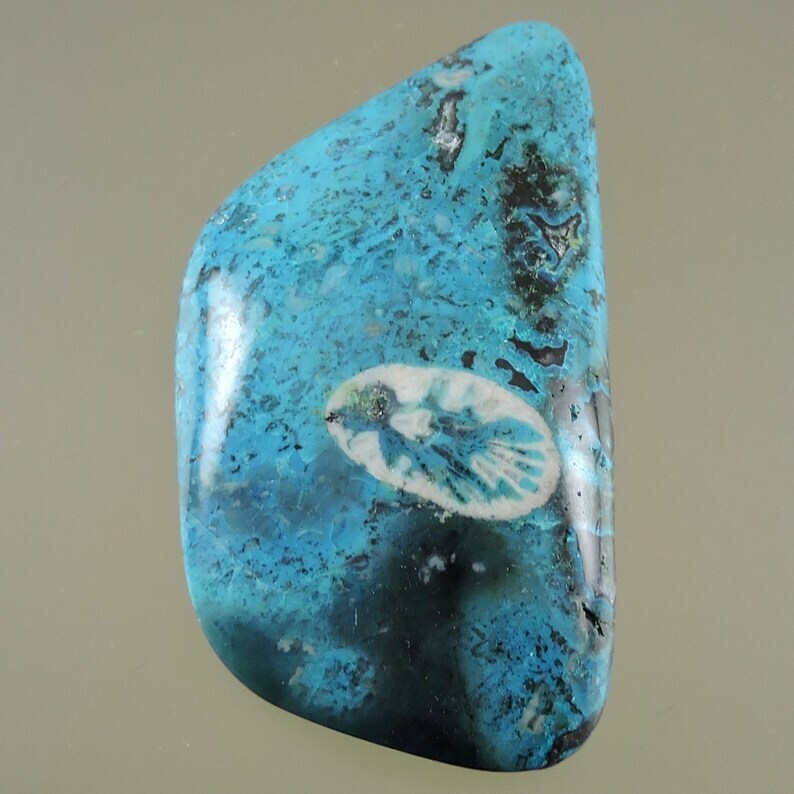 Chrysocolla is a "Stone of Harmony" and is said to purify and remove negative energy. Fossils are said to help increase accomplishments in business. This is an incredibly beautiful stone! Beautiful stones. Low profile . Fast shipping. Purchase $250.00 or more in one order and receive a 10% discount. Just use coupon code "ETSYISLOVE" at checkout. Purchase $500.00 or more in one order and receive a 15% discount. Just use coupon code "ETSYHANDMADE" at checkout. We offer a 100% guarantee on all of our items. Just contact us within 15 days of receipt of your purchase then return your item and we will refund your money, no questions asked. We will gladly put your item on RESERVE for up to 15 days. Just send us a convo.